I tasted my first Alaskan brewed beer when we were in Denali. They had the White Ale from the Alaskan Brewing Company on tap so I decided to give it a try. I’m more of wine drinker than beer drinker, but I do appreciate a good microbrew. This was among the best I have tasted. On our way back from the dog sledding/helicopter trip in Juneau, our driver offered to drop us off anywhere we wanted to go in the downtown area instead of back at the cruise ship docks. He told us about the highlights of downtown and mentioned the Alaskan Brewing Company. I guess I didn’t realize it was brewed in Juneau. He said the brewery was just outside town. The tour, he said, was a little untraditional as it doesn’t really go through the brewery but rather to a tasting room where you hear about the brewery’s history, which was a neat story, he said, then you get to sample as many beers as you could stomach. We hadn’t made any plans for Juneau other than the dog sledding excursion so we were open to suggestions. We also have an unintentional habit of visiting breweries while traveling (Guinness in Dublin, Budweiser in St. Louis, New Glarus in New Glarus, Wisc., etc). The deal was further sweetened when he said the brewery had a merchandise store downtown and they operate a shuttle service to and from the brewery from that shop. Sounded good. But we wanted to grab some lunch, we told our driver. Um. No. We LOVE crab. 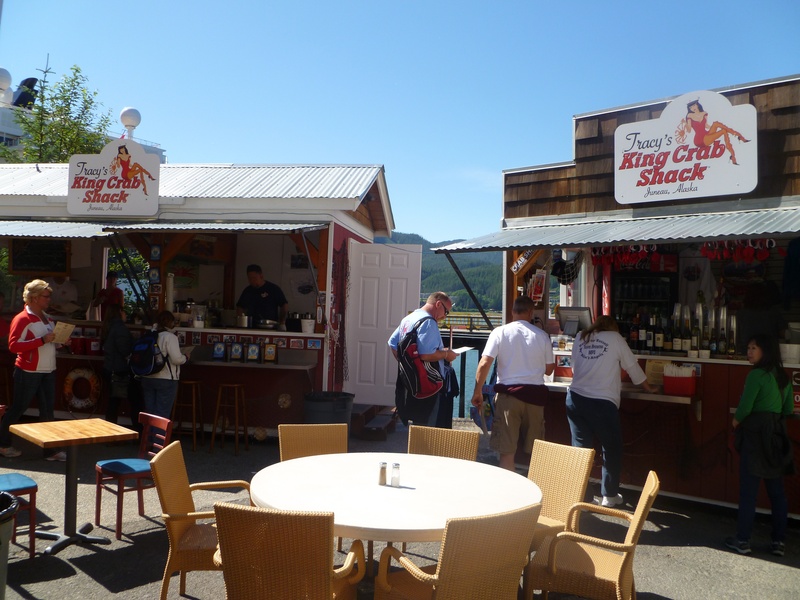 You have to have a king crab leg and chowder from Tracy’s Crab Shack, he told us. 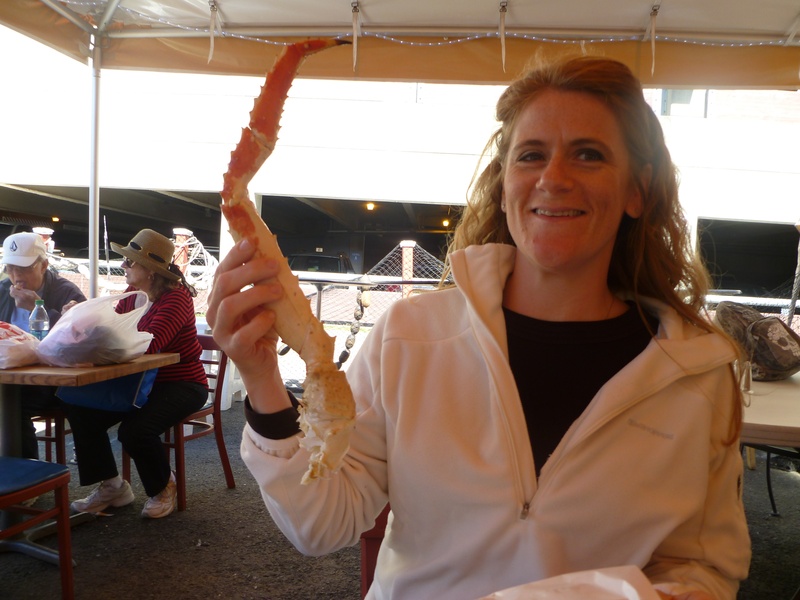 I had actually heard about Tracy’s from the Cruise Critic boards where it was described as THE place for Bering Sea crab legs in all of Alaska. If it’s THE place, how could we say no? Tracy’s is just two trailers side-by-side. You order your food and get drinks at the first one and they cook it in the second one. We ordered one crab leg a piece and a crab bisque to share. When the legs came out, we just stared at them in disbelief. I’m convinced the Bering Sea is steroid water. They were as tasty as they were big. And the bisque was among the best I’ve ever had. With bellies full of crab, we made our way to Franklin Street and immediately saw the Alaskan Brewing Company store. In front of the store was a guy yelling that the next tour was leaving in 10 minutes. Perfect timing! We took a shuttle van to the outskirts of town to the brewery. In the tasting room, the on-duty brewmaster gave us an overview of the company and a little bit about its history which, as our earlier driver told us, is quite interesting. 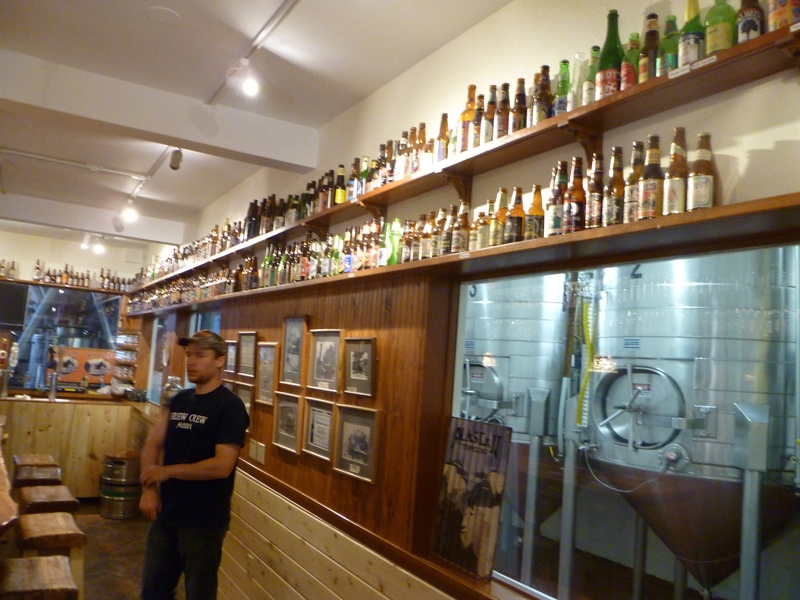 The walls were lined with microbrews from every state. We had no idea there were microbreweries in the Florida Keys! First, a little bit about Juneau. If you are ever on Jeopardy! and the answer is “the only U.S. Capitol accessible only by boat or airplane” the correct response would be Juneau. If you’re thinking, wait a minute, that can’t be correct. What about Honolulu — which is what we thought when we first heard this — Honolulu is on an island, yes. But it’s the island that’s accessible only by boat or plane, not the city. There are roads on the island that go into and out of the city of Honolulu. Juneau is not an island, but there are no roads going into or out because it’s surrounded by water on one side and mountain and glaciers on the other side. So, in the 1980s the founders of the Alaskan Brewing Company, a couple named Marcy and Geoff Larson, wanted to open a brewery. Considering the whole boat or water thing, the idea seemed a little crazy since the cost of importing supplies and exporting the product would mean beer that would have to sell for champagne prices. The Larson’s explored ways to keep the costs down, then went to some fellow residents of Juneau with the idea. They ultimately decided “why not?”and they got several local investors on board. Some of the same investors volunteered their time to get the brewery up and running. Well, technically, they were being paid. In beer. Whatever beer bottles came off the lines with crooked labels or other cosmetic defects, the volunteers would keep. Word spread and they soon had so many volunteers they had to split them in to three shifts. The brewery operated this way – solely with volunteers — for the first six years of its existence. The Larsons continue to find ways they can save money and reduce their carbon footprint through green technology and innovations. They have more about that on their website. Their beers have won numerous awards. And I can say, they serve up a tasty pint. They now distribute the beer to 18 of the lower 48 states, which does not include Illinois. But, we are very close to Wisconsin which is one if the 18. Brian was up there for business a couple of weeks ago, found the beer in a store and brought some home. We can now enjoy a pint and think of our time in Alaska. And, more specifically, Juneau. Now. If only we could find some of those King crab legs! 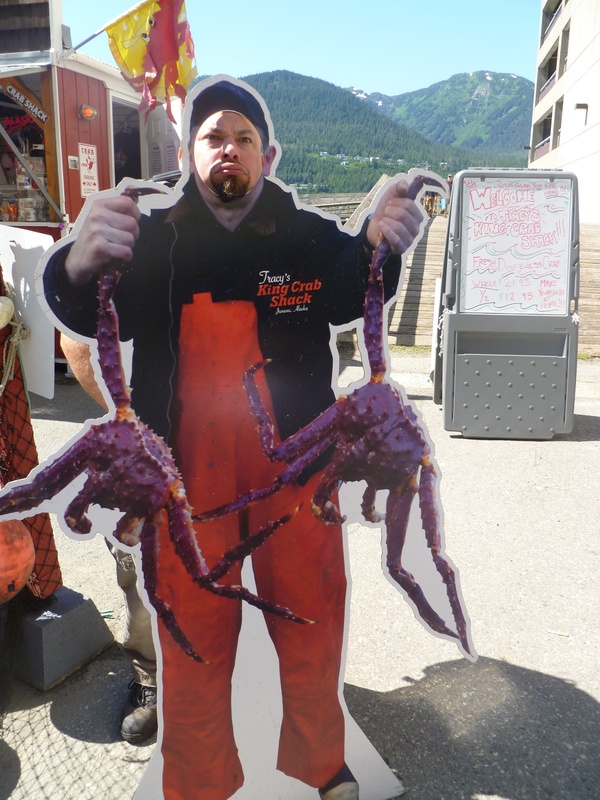 This entry was posted in Alaska, Alaska, bucket list, bucket list, Juneau, traveling and tagged Alaska beer, Alaskan Brewing Company, Bering sea crab, Juneau, king crab, microbrews, Tracy's Crab Shack. Bookmark the permalink. Ate at Tracy’s last week when in town off a cruise ship. 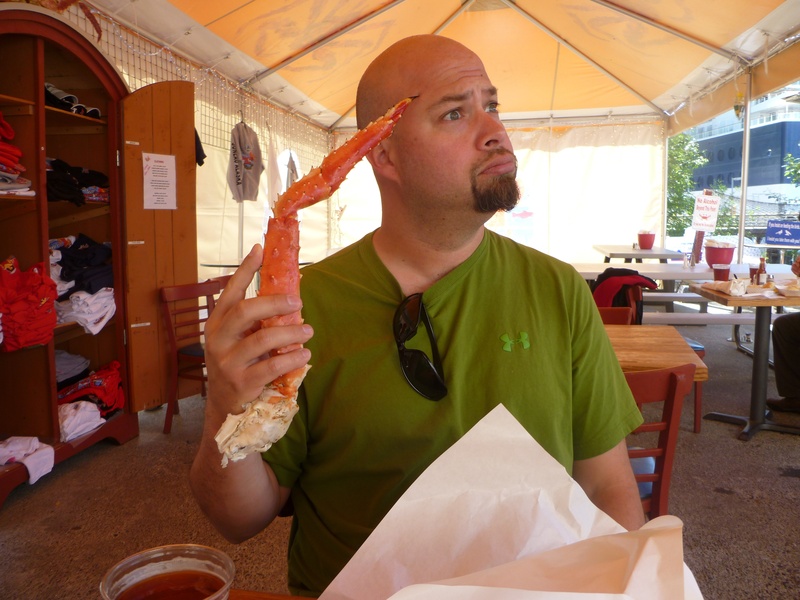 We had the crab bisque and king crab legs too. Outstanding! A great place to hang out and relax there. Agreed! Glad you found it and enjoyed it!